Yesterday I babbled about my personal journey as a browser user. I apologize if you read though that whole thing waiting to get to the information that I’m actually going to share with you today. I at least hope you were mildly entertained. 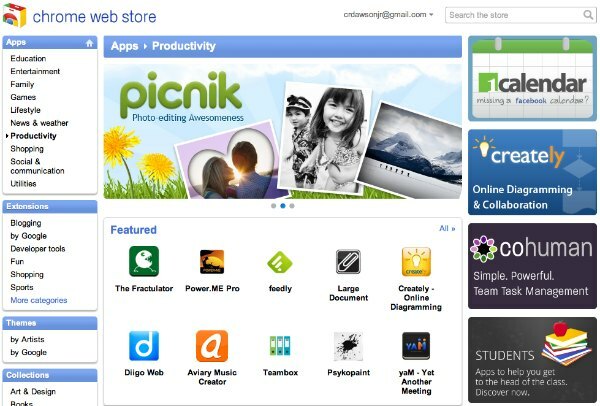 The Chrome Web Store has thousands of apps and extensions for the browser. Where I left off yesterday was how Google Chrome has stolen my heart away from Firefox. Me and the Fox were already headed for a bad breakup for the reasons I mentioned yesterday. Ultimately, I think it just got too bulky as a browser. Google Chrome is lean, mean and clean. I actually think Chrome is more Apple-esque than even Safari. The interface is like the aerodynamic artistry of a Maserati. It’s beautiful to behold. Minimal buttons. And no search bar. This threw me off at first because I was so used to Safari and Firefox’s built-in search bars. Then I had a hunch! (playing all those Myst games back in the mid to late ’90s really enhanced my deductive capabilities). I typed a search term in the URL locator and lo and behold discovered the power of the Omnibox (imagine a loud, booming, echoing voice saying “OMNIBOX!”) This thing was so cool. And like Google’s powerful search engine, as you type search terms, it’ll offer suggested results even before you stop typing. Here are the other features I love about Chrome. I know that some of these are also features of the other browsers, but Chrome’s implementation seems so much more elegant. Fast. This is by far one of the best aspects of this browser. Second only to its elegant design in my opinion. Chrome is blazing fast. I haven’t done any speed tests, but Google “chrome speed test” and I’m sure you’ll find a bunch of comparisons. One I read from last year gave the crown to Chrome. Google Docs and Apps. As I’ve written before, I’m a bona fide Google junkie. I practically run my whole business on it. Naturally then, the way Chrome works with things like Gmail, Google calendar, and Google docs is exceptional. Extensions. All my favorite web-based and productivity tools (Evernote, bit.ly URL shortner, Xmarks) have Chrome extensions that allow me to use their features right from within Chrome. Installing them is easy peasy. If I come to a sight that has a Chrome extension, if offers to install it. Click a button. Wait a few seconds and boom. You’re done. Web apps. Similar to extensions are Web apps. There are thousands available for Chrome. Easily searchable and installed from the Chrome Web Store. Stability. If a site in one of my open tabs crashes, only that tab is affected. I don’t have to restart the entire program. Themes. Tired of boring gray. Change the background image and color scheme of your browser in a few clicks. There are hundreds, maybe even thousands of themes to choose from. Bookmarks. Browsing and managing bookmarks is a breeze. Chrome’s preferences and bookmarks manager open as separate web pages that open in a separate tab. It’s a much better experience than the small preference windows that normally pop-up. The other thing that’s really cool is that you can synchronize your Google Chrome bookmarks across other computers from within Chrome. I personally turn that feature off because I use Xmarks.com to sync across multiple browsers and computers, and it causes duplicates if you have Chrome synching on too. But, if you don’t need the ability to sync across browsers, Chrome’s sync feature is sweet. There are a few drawbacks that are insignificant. For instance, as far as I can tell, you can’t make the tabs go beneath the Omnibox vs. above them, a feature my wife misses since I switched her to Google Chrome. But, ever since the switch, she no longer has the issue of her computer running slow. (I have to confess. For months I heard my wife comlain about her computer running slow and I knew it was probably because of Firefox. I hesitated in telling her because for various reasons, I sometimes find myself on her computer, or her laptop, and I knew if she discovered Google Chrome she’d want to use her bookmarks instead of mine. Of course, with Xmarks.com we could set up a separate profile for each of us, but I knew she wouldn’t want to do that either. So, I held off on telling her about Chrome. I know, I know. That was so selfish of me. I’m a terrible husband). Bottomline: if you’re not using Chrome, you’re missing out. Tell us your favorite Chrome story. I stopped using Chrome last year and actually went back to Firefox. At the time there seemed to be some issues in Chrome resolving DNS or some such thing that was unbelievably frustrating, causing long load times for web pages. So far, I haven’t missed anything in Chrome but I’m not exactly a browser power user. I don’t use themes, very many extensions, etc. I just need something that will show me my webpage as quickly as possible and preferably doesn’t crash, and both Safari on the Mac and Firefox when I’m on my PC do just fine. It’s definitely worth another try David. I’ve never had speed or page loading issues. Just the opposite. Of course, I’m using MacOS 10.6.7, so I can’t speak to how a Windows version works. But they have frequent updates to the browser. Just in the 6 months I’ve been using it, there have been about as many updates (which happen automatically when you launch the browser). Give it another go. I tried Chrome a few times in the past but each time I found issues with it that kept me from switching. I ran speed tests on Safari, Chrome & Firefox recently and found them all to be pretty much the same with Safari actually edging out Chrome as the fastest. A friend at work, like you, is totally sold on Chrome so I have decided to give it a try-at the office. Still on Safari at home…..time will tell. Thanks for the insight! That’s the one thing about working on the internet…so many different computer systems and set-ups can affect ones individual performance. W/o a doubt, on our computers, Firefox is slow and Safari’s speed doesn’t compare to Chrome’s. I would love to use Chrome, but it has one fatal flaw that prevents me from using it: lack of proper color management for wide gamut monitors. I am a photographer and use an NEC wide gamut monitor, and Chrome doesn’t display color correctly. It makes photos look over saturated. If they would fix that, I’d drop Safari and switch. You make an interesting point Steve about color issue. Can’t you use a monitor calibrator for that? I love Google Chrome! Used it since the day it was released. And I was an avid Firefoxer before that. Google crhome has so many innovative features that’s why mostly people like to choose it as default browser. I also like Google Chrome and its features. Thanks for this nice addition into our info. I switched from Firefox to Chrome on my desktop PC. Chrome runs faster where page loads and overall usage are more responsive with fluid transitions, plus YouTube videos run much smoother without stutter effects. Whatever, i’m sticking to chrome because the performance is clearly better !